There's something special about a family-run business. It's more than just a business, it's a passion that has been passed along through generations. Jay and Kylanne Sandelin and their two boys own and operate Great Northern Powder Guides, a snow-cat skiing operation north of Whitefish, Montana. GNPG runs day and multi-day cat skiing trips for all levels of riders in the Stillwater Forest. This operation is fueled by passion and a love for family. Jay, a former World Cup and professional speed skier, once was one of the top-ranked speed skiers in the sport, reaching speeds of 142 miles per hour. He was raised in Steamboat Springs, Colorado, where in his younger days he could be found ski racing on Steamboat's slopes or sending it big off the 70-meter jump at Steamboat's legendary Howelsen Hill. It was at Steamboat in the early '80s that Jay met Kylanne, who had moved to Steamboat from Illinois to ski-bum for a year. Well, most ski bums know how that "Just one year" story plays out — several years later, Ky was still at Steamboat with a wedding ring on her finger and a bright future ahead with Jay. "We came to Montana to raise a family," said Jay. "We couldn't afford to live in Steamboat anymore, so we moved to Whitefish; it was 10 years in the past. It was like Colorado was, only the prices were less expensive and it offered a great environment to raise our family." That was more than 20 years ago; since then, Jay and Ky have had two boys, Tarn and Dayne, and own and operate a successful road construction company. Hard work during the week was rewarded with family skiing at nearby Whitefish Mountain Resort every chance they got. Skiing and road construction were a major part of the boys' upbringing, so when the opportunity to take over an existing cat skiing permit came up five years ago, the Sandelin clan jumped in with all eight feet. It seemed like a perfect transition for the whole family. Jay and Ky handle day-to-day operations, including bookings, making lunches, guest services, bookkeeping, some guiding, cat driving and janitorial work. The boys are in the mix; Tarn drives the cats, turns wrenches and fabricates custom-made cat skiing boxes — a business which morphed out of GNPG — for other operators. Younger brother Dayne is one of the guides, a cat and helicopter mechanic, and drives cats as well. A family that works together stays together. GNPG operates with three custom-designed PistenBully 300s. Each cat holds up to 12 guests, two guides and one GNPG staff photographer, who documents the day and provides guests with an opportunity to take home memorable images of their cat skiing experience at a nominal fee. GNPG has a permit to guide powder-hungry riders in 15,000 acres of varying terrain in the Stillwater State Forest. Their terrain has something for everyone: "We have open areas, we have burned areas, we have pillows, we have glades, we have steeps, we have rocks, we have pretty much everything that is out there, and that's what makes it unique," says Jay. "We have terrain for just about anybody who skis with us." Someone who knows a little bit about the Montana backcountry is Landon Gardner, a Missoula native and a former member of the U.S. freestyle ski team for nine years. This was his first trip out to GNPG, and he was blown away. "I'm going to need to come back to Great Northern Powder Guides. I'm getting an idea of the terrain out here; it's really cool," he says. "We did get to sample a portion of their terrain over the past two days — plenty of fun, steep treed runs, lots of rocks and small poppers, 5, 10, 15 feet of air. That's what I like. I can't wait to come back." GNPG is a four-hour drive from the Spokane/Coeur d'Alene area, located 20 miles north of Whitefish on Highway 93. "It's right off the highway," says powder aficionado Tommy Frey, from Hayden, Idaho. "You come in the morning and have a nice breakfast, go over what's gonna happen for the day, load up right there on the cat. A short cat ride up and you're skiing. A real easy, accessible place to come to, and real fun to ski." 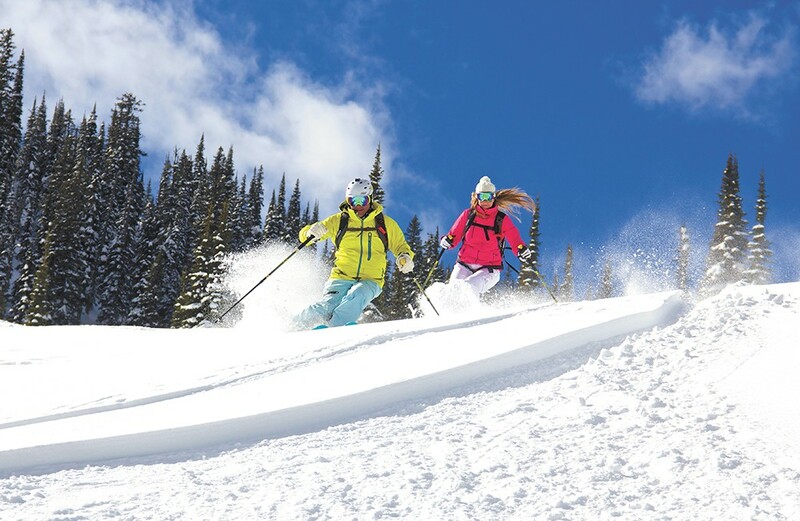 With Whitefish right down the road, there are plenty of choices for food and lodging. Put the Great Northern Bar & Grill, a Whitefish landmark, on your list for good burgers and beers. GNPG is committed to keeping its guests safe and educated before heading into the backcountry; each guest participates in an avalanche safety session prior to going up. Not only do the guides have vast avalanche and first aid training, they also serve up a pretty good meal, as Hayden Lake's Rhen Lyden found out: "Lunches have been great. Yesterday we ate in the cat in between runs and it was really good. Today, Tarn cooked some big Montana-style burgers for us on the BBQ at the yurt. It was nice to get in there, dry off, sit down, have some hot soup, coffee, cocoa — they have everything you need right here." Great Northern Powder Guides from Bob Legasa-Freeride Media on Vimeo. On our first day last March, we were treated to bluebird skies and just over 11,000 vertical feet of skiing in the "steep and deep" cat. Steep is right: We got on a few runs that definitely got the heart pumping! Landon and Rhen were in heaven, sending off pretty much everything in sight. Day 2 saw a couple of new guests join our group. One of the guests had flown out from Vermont for his very first cat skiing trip; the other was enjoying his third trip of the season to GNPG, which says a lot. It snowed all day, steadily stacking up and making each run better and better as the day progressed. It was sad to leave, just when it was getting so good. We heard the next day was fantastic. We're used to hearing "You should have been here yesterday" — just our luck. Oh well, not bad for late March! "I really think Great Northern Powder Guides has the most amazing trees; there's lot of character trees, everywhere you ski, that are old, gnarly trees," says Desiree' Leipham of Spokane, who has visited her fair share of backcountry operations. "You can tell the weather really rolls through up here. The character trees, mixed with the surrounding scenery, is breathtaking. [This] is a special place I want to come back to." 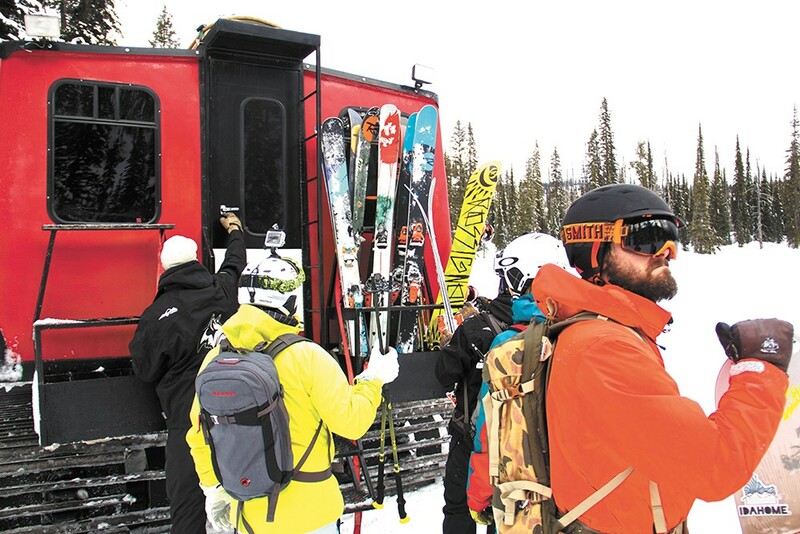 The top-notch riding comes with famous Montana hospitality — one of the reasons why GNPG's business has just about doubled in guests every season.